Pictured is a conceptual design for a new Campus Life Center created by Duda/Paine Architects — among a series of models and drawings provided to elicit community feedback during a public presentation in the Dobbs University Center in March. The design offers only a conceptual vision of what the project might look like, says University Architect Jen Fabrick. Wednesday, July 29, 3-5 p.m.
“After reviewing all the comments, it was the most favored concept among students, who responded with enthusiasm to “the variety of indoor and outdoor spaces,” she notes. While the initial Duda/Paine concepts do not necessarily reflect the final look of the future CLC, the architectural firm presented design elements that reflect a sleek, modern aesthetic, with a multi-storied central structure steeped in natural light and surrounded by open walkways and plazas, terraced plantings and a major water feature. In the end, Duda/Paine became a top choice based upon the firm’s “incredible understanding of —and for — Emory, a strong sense of creativity and professionalism, and excellent communication skills,” Fabrick explains. Also working in the firm’s favor: experience creating a new campus student center, the Talley Student Union, at North Carolina State University in Raleigh, North Carolina, she adds. At the upcoming open house, Duda/Paine associates will share preliminary information on the CLC project shaped by a series of programming workshops held on campus this summer. The firm also will solicit feedback on program needs and project components, says DUC Director Ben Perlman. “Anyone from the community who is interested is welcome to come, to meet the actual architects and learn more about what they are proposing,” Perlman says. Another forum to gather public input will be held once students are back on campus for the fall semester. “We’ll still be looking for campus feedback, but the tone for that meeting will be more along the lines of ‘We’re planning on doing this, what do you think?’” he says. 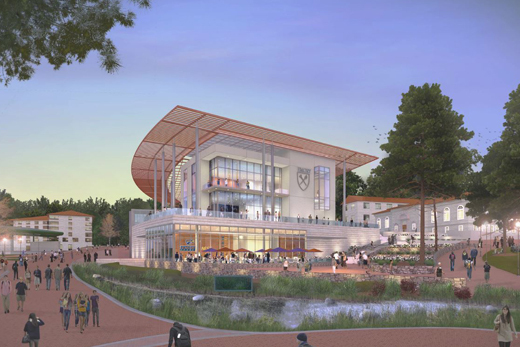 Plans to revitalize the DUC are rooted in a desire to enhance Emory’s learning community by creating an easy-to-navigate space that is welcoming to all, with design elements that unite Campus Life services with student organizations and lounge spaces, centralize resources, and promote collaboration, according to a 2014 campus feasibility study. The re-envisioned space could also support large-scale events by offering bigger, flexible meeting spaces. Plans include morning to late night retail and dining options and uniting the community through a common, expanded dining experience. The feasibility study calls for tearing down the Portman (West DUC) Building and creating a new structure in its place, while preserving the East DUC, including the Alumni Memorial University Center, with its marble façade, and the Harland Cinema.